Larger storage solutions are becoming standard fare in today’s home and office. We are collecting more data about everything than just a few years ago. With the transition many homes and small companies are making into the digital realm with data and storage, it may become a dizzying proposition to find a solution to your storage needs. In many circumstances, a NAS may just be overkill and a simple answer is what you are looking for. 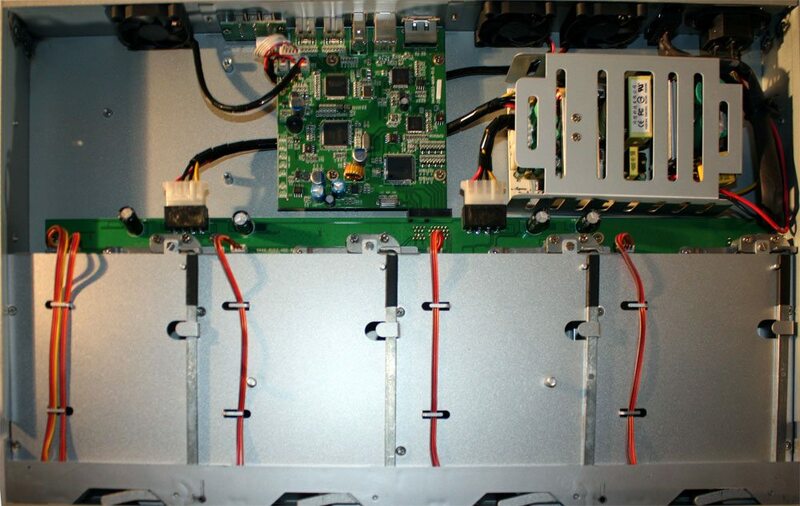 Enter the RAIDAGE GAGE104U40SL-SAUF Trayless Hardware RAID enclosure. The GAGE104U40SL-SAUF is really a dual purpose storage solution. The idea behind the unit is that it can be rack mounted for extra server storage space by purchasing the optional rails, or it can make a very attractive storage element on your desk. The entire unit is constructed of high quality aluminum, measures 19.00″ x 1.70″ x 11.50″, can home four SATA I/II/III 3.5 inch hard drives, includes three ultra quiet 40mm cooling fans, and supports RAID 0, 1, 3, 5, 1+0, Combine (JBOD). There are varying interfaces for your connection pleasure as the unit sports USB 3.0, eSATA, FireWire400, and FireWire800 interfaces. All the necessary cabling is included. The sleek and slim design of the GAGE104U40SL-SAUF lays your hard drives out side by side and uses a tool free system for removing and installing hard drives. Hard drive installation is as easy as opening the VERY thick aluminum front panel, nearly ¼ inch thick, and pushing a drive in. To remove a drive, just pull the lever above the drive you wish to remove with your finger, and the drive easily removes. Because of the all aluminum construction, the release mechanism gives you that “scraping along the chalkboard” feeling when you pull it to release a drive. The front of the GAGE104U40SL-SAUF is very simple, which makes it very elegant; there are just four LEDs for activity that light blue when idle, blink purple with activity, and alarm you with red if there is an error. Directly behind the front panel door rest your drives and two small buttons, one power button, and and a SET button. Around back you have all the connectivity options, the switches for RAID configuration, the three 40mm exhaust fans for cooling, and the power connection. I have to give some “props” here for designing the unit to use a standard PC power cable and internal power supply and not requiring a brick. This would defeat the purpose of the ability to rack mount the unit. The GAGE104U40SL-SAUF features its own internal RAID solution which makes setting up a breeze, and it also makes it Mac, Linux, and Windows compatible because you don’t have to worry about installing any RAID cards in your system. The already mentioned RAID configuration switches in the back let you pick which type of RAID you wish to use. A few magic shakes from your wand (a a power on while holding the “SET” button) and you are off and running. If you are concerned about accidentally changing your RAID setup by knocking some switches around on the back, don’t be. You are required to “clear RAID” before you can change the RAID configuration; which means you have to follow the same process to create RAID, but instead flipping all the switches to CLEAR, powering on holding the SET button, then powering down, picking your new RAID level and powering on, again holding the SET button. Creating the RAID array was much easier than I had expected. Given my struggles with other RAID devices, I had expected more of the same here. Instead the RAID creation worked first time around without a hitch and Windows 7 recognized the (four 1.5TB drives in RAID 5) 4.5 TB drive immediately.